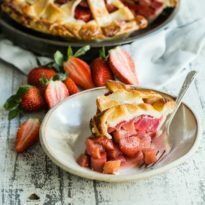 If you’re lucky enough to find stalks of fresh rhubarb and good strawberries, then this pie should be at the very top of your to-do list. A masterpiece of sweet-tart fruit baked under a flaky lattice crust that’s deceptively simple to tackle, this perennial favorite may get gobbled up in less time than it takes to bake. Keep your fork, there’s pie! Despite what you may think, rhubarb is a actually a vegetable with ancient origins in Western China, Tibet, Mongolia, and Siberia. Much later, the first rhubarb seeds arrived in the American colonies in the 1730s. Today, known as the “the pie plant,” rhubarb gained in popularity in America around the same time that sugar became widely available, and for good reason. In case you’ve ever heard this, don’t worry. Only the leaves of the rhubarb plant are very high in oxalic acid, which could be potentially toxic if ingested in large quantities. Thankfully the stems are the only thing anybody uses, and they’re not only safe, they’re delicious. Can you freeze Strawberry Rhubarb Pie? In order to freeze this pie, wrap the unbaked pie tightly with aluminum foil or plastic freezer wrap, then place in heavy-duty freezer bag. When ready to bake, there’s no need to thaw the pie, just pop it in the pre-heated oven frozen. Can Strawberry Rhubarb Pie be made without sugar? 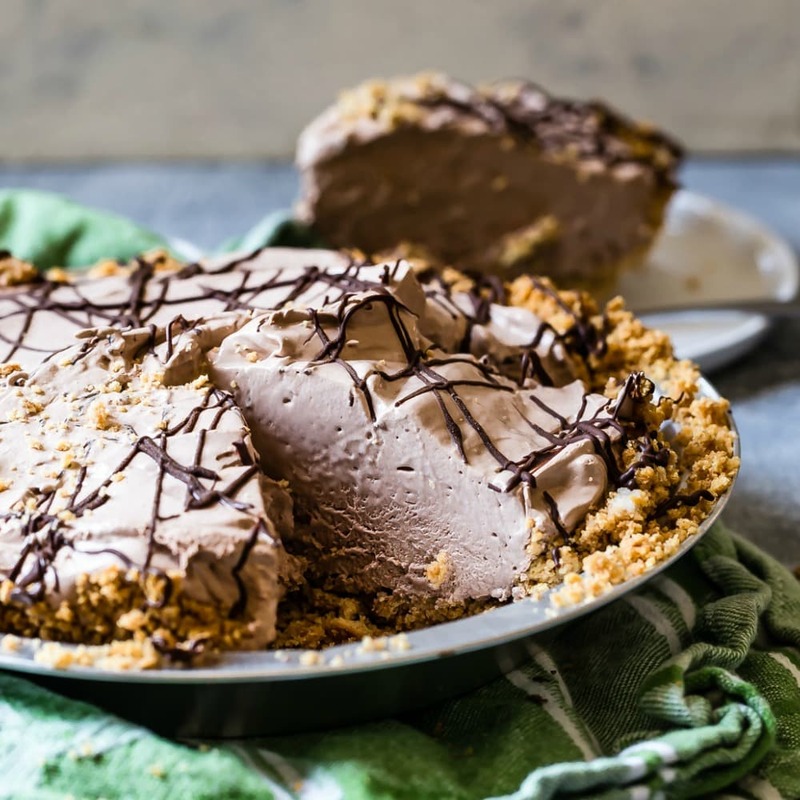 While this pie definitely needs sweetness of some kind to temper the super-tart rhubarb, you can substitute a sugar-free baking sweetener, such as Splenda. What is the history of Strawberry Rhubarb Pie? 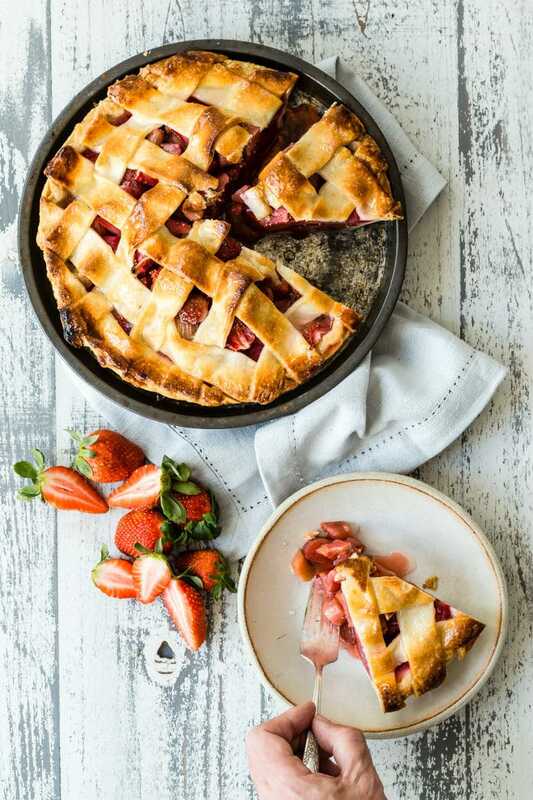 Amazingly, some fruit and vegetable historians claim that strawberry rhubarb pie originally didn’t include both strawberries and rhubarb, two fruits with distinctly different seasons, but a specific variety of rhubarb known for its bright red hue: Strawberry Rhubarb. It may have been a misunderstanding that created one tasty happy accident! How can I prevent a runny Strawberry Rhubarb Pie? Sometimes, the juiciest fruit pie can get out of hand! 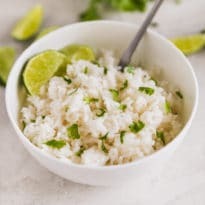 The cornstarch in the recipe helps rein in the liquid, but other cooks use tapioca, cornstarch, or even flour instead. Just to be on the safe side (and because I hate cleaning my oven) use a drip pan under the pie as it bakes. Can I use frozen fruit to make Strawberry Rhubarb Pie? If you’ve got some chopped rhubarb in the freezer, or if you can only find frozen fruit, by all means make this pie. You don’t have to let the fruit thaw, as long as it’s chopped. Just toss the frozen fruit in a bowl with the sugar, cornstarch, salt and vanilla and assemble and bake the pie according to the instructions. Should Strawberry Rhubarb Pie be refrigerated? 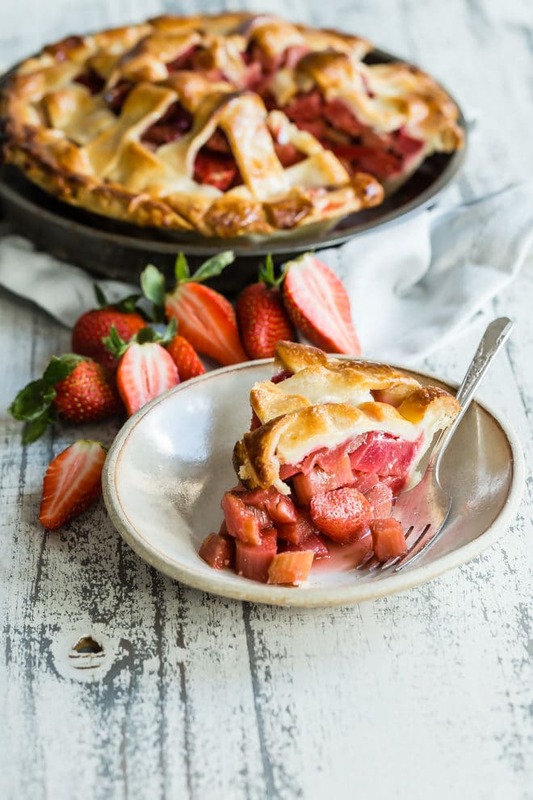 If you’re lucky enough to find stalks of fresh rhubarb and good strawberries, then this pie should be at the very top of your to-do list. 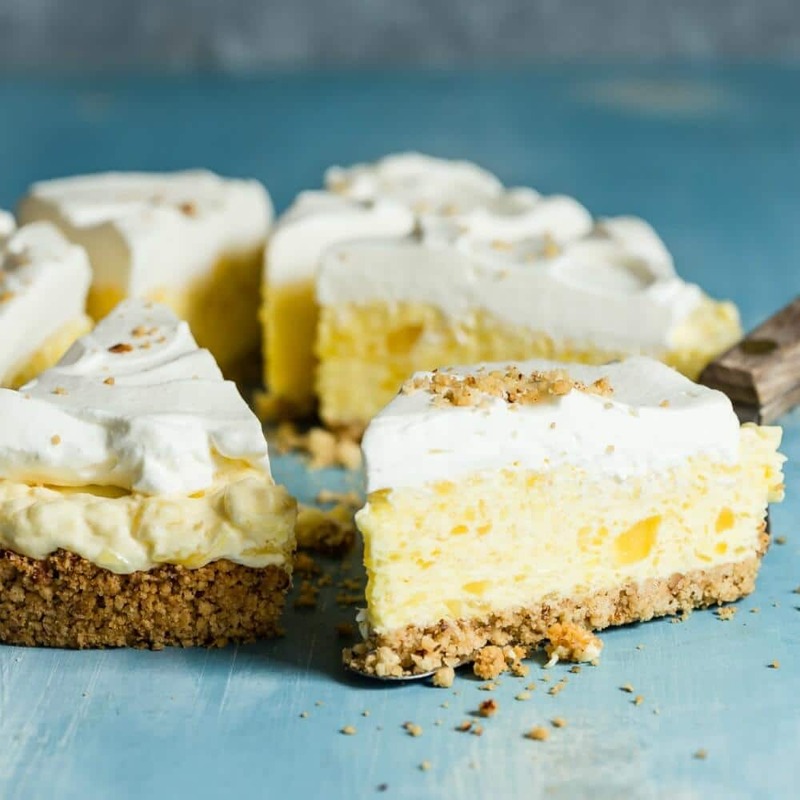 A masterpiece of sweet-tart fruit baked under a flaky lattice crust that’s deceptively simple to tackle, this perennial favorite may get gobbled up in less time than it takes to bake. Keep your fork, there's pie! In a large bowl, add rhubarb, strawberries, and 1 cup of sugar and toss to combine. Let sit at room temperature until the fruit releases its juices, about 1 hour. Meanwhile, line a 9-inch pie plate with 1 pie crust, letting the excess dough hang over the edge. Cover with plastic wrap and refrigerate while the fruit rests. 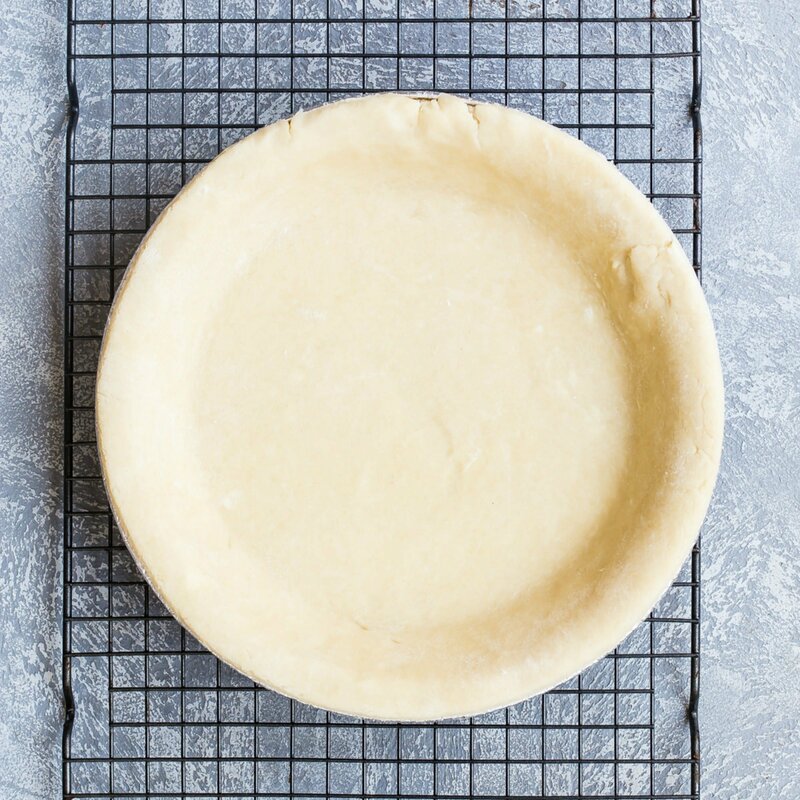 Using a pizza wheel or pastry wheel, cut the second pie crust into even strips for a lattice top, about 1/2-inch to 3/4-inch wide strips. Refrigerate while assembling the pie. Adjust an oven rack to the lowest position and preheat oven to 425 degrees. Line a rimmed baking sheet with foil. Drain fruit well reserving 1/4 cup of juice. In a large bowl, add fruit, reserved fruit, cornstarch, vanilla, and salt and toss to combine. Taste fruit and add more sugar to taste if desired. Pour fruit into prepared pie crust, mounding it in the middle. Lay 4 to 7 parallel strips of pie crust about 1/2-inch apart to form the first layer of lattice. Fold back every other strip. Place one long strip of pie crust perpendicular across all parallel strips. Unfold the folded parallel strips over the perpendicular strip. Fold back parallel strips running under perpendicular strip. Lay another perpendicular strip next to the first, about 1/2-inch apart. Unfold the folded parallel strips over the perpendicular strip. Continue adding perpendicular strips, folding back the parallel strips then unfolding, until the entire top of the pie crust is covered with lattice. Crimp the strips to the lower crust to seal the edges. In a small bowl, beat egg and milk. Brush on crust and sprinkle with remaining 1 tablespoon sugar. Set pie on baking sheet place in oven. Bake until the top crust is golden, about 25 minutes. 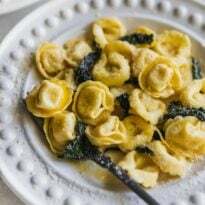 Reduce the oven temperature to 375 degrees, rotate the baking sheet, and continue bake until the juices are bubbling and the crust is deep golden brown, 25 to 35 minutes longer. Let the pie cool on a wire rack until the filling has set, about 2 hours; serve slightly warm or at room temperature. Almost identical to the recipe I use. You can also use tapioca flour/starch instead of the beads. Put the beads in a blender – pulse – viola! Flour. Works great!